The 410 Fish is an adaptable open fishing boat that will take an outboard engine up to 20hp, yet is light enough to row. It can be supplied for a tiller-steer engine or with an optional steering console. The 440 Fish will take an outboard engine or is light enough to row.It offers lots of storage space and it will become your best companion for fishing. An optional steering console is available to increase your driving comfort. he 500 Fish - a boat of Scandinavian inspirations - brings the range a touch of tradition. With spacious and beamy cockpit, the 500 Fish can carry up to 6 people. It can take up to a 60 HP outboard and comes with a standard pilot console. Sport Why the Sport range? 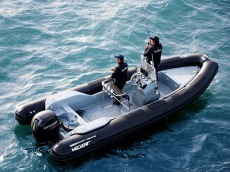 The Sport range has been specifically designed for customers looking for functionality, performance and seaworthiness at a very competitive price. 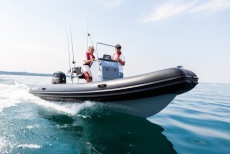 Whether you are a new boater or an amateur of nautical sports such as waterskiing, fishing, diving or a professional looking to adapt its Rib to specific criteria, you will find the boat that will correspond to your need. Extremely versatile The Sport line offers a complete range of seven models from 4.7m to 7.6m. 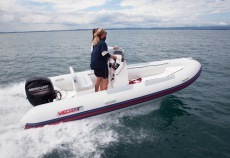 Whether you need a Rib for long distance trips, coast and island hopping or suitable for a small family or large group of friends, you will find the model that suits you! 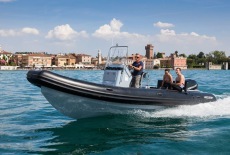 Room and safety for all All Ribs have been designed to offer functionality and to ensure complete safety on board. 4 new decks have been introduced this year offering a complete open deck with increased internal space and functionality. All decks are anti-slippery and simply equipped at the bow with anchor lockers; 630 and 760 models have independent anchor and bow lockers. Fuel tanks are integrated in the deck from 580 model and up (optional for 500 and 550) and easily accessible. Customize your boat up to your need Each Valiant sport model is sold as a turnkey package. Based on your preferences and your needs, you can customize your boat with a large selection of tube colors and material, upholstery, seatings, many other accessories and engine. The choice is yours. Need help for your configuration? In order to facilitate your selection, we have created some recommended packages. In collaboration with professional fishermen, we have also developed specific “Fishing packages” for 5 of our Sport models: 550, 580, 630, 690 and 760 models. At the end, the choice remains yours. Fishing Package Valiant is now very active in the “fishing world”. Sport Fishing Packages have been developed and validated by professionals and competitors for the purpose of the Grand Pavois Fishing contest that takes places every year during the Grand Pavois Boat Show in La Rochelle (France). This year 5 of our Sport models from the 5,5m up to the 7,60m are equipped with those Fishing Packages. The Fishing packages include all a large livewell integrated in the stern deck and one set of 4 rod holders; the 550 model comes with a locker under the leaning post equipped with a livewell kit. In order to increase the comfort of the fisherman’s, all packages are equipped with a new consoles with hydraulic steering system and navigation lights, leaning post, fuel tank integrated, bathing ladder, Smartcraft on the 690 & 760 models; the admiral 760 model comes with a bench locker located at the stern. 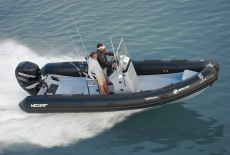 Choose your finish Personalize your Rib with the choices available of material, hulls and tube colors. We are using the best material quality in the market: The PVC, in Haku Mehler Dtex 1100, is a heavy duty, long life fabric that provides excellent resistance to cuts, abrasion and normal wear; all the seams are welded. The Hypalon, in Orca Dtex 1670 or 1100, offers a much-thicker layer that delivers superior performance in the most extreme conditions. It provides excellent resistance to abrasion, hydrocarbons, flame, ultraviolet light and fading. Choose your color upon selection available: light grey, dark grey, black, orange.